I has to haf another surgery to remove another small tumor. The maybe we can do some treatment. We just has to take a look at our finances and figure it all out. Otherwise I is doing ok. The mom gived up on putting that suit on me for now. And once she took it off me I pulled out all of the furs on my front legs where the sleeves were. Now the mom feels like a horrible person for making me wear it. The 2nd thing I did was lick the scab off mine belly again. So I got the cone of shame back for a while. So after that I just sat around and cried and cried and howled all night to keep her up. I'm so sorry you are going through a tough time, Sammy. I'm sending lots of purrs to you. And I am purring my hardest for you, too. Oh Sammy! We are sorry it's all so tough but you really have to work with your Mom! We re crossing all our paws and hooves. I am sorry you are having such a hard time Sammy. I hope your next surgery goes well and you soon can get your next treatment. Oh, Sammy, we are very sorry that you are having such a rough time. We hope that this next surgery will give you some relief and your treatments will help you. We are all sending you the Power of the Paw. Purrayers & POTP for you Sammy. Your Mom is trying to help you get better, even if she does things you don't like. Please try to be patient and do what you need to get better. 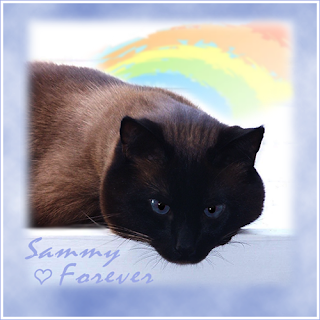 We send lots and lots of purrs to you Sammy. We hope this next treatment will really help you lots! Poor little boy! We will purr for you! Oh Sammy, I feels sorry for you to have to go through all of this. Surgery, the cone, funny clothes. Get better. Hang in there, Sammy! Your mom is trying to do everything she can to help you feel better, even if it is uncomfortable at the moment. The cone of shame will come off but you have to stop chewing yourself up.